We have teamed up with blogger and travel writer Charli Moore to provide you with an insider’s guide to our beautiful island’s activities and attractions. She’ll also be reviewing Nevis’ varied array of eateries and beach bars; here she talks to Sunshine, owner of the iconic Sunshine’s Bar & Grill. 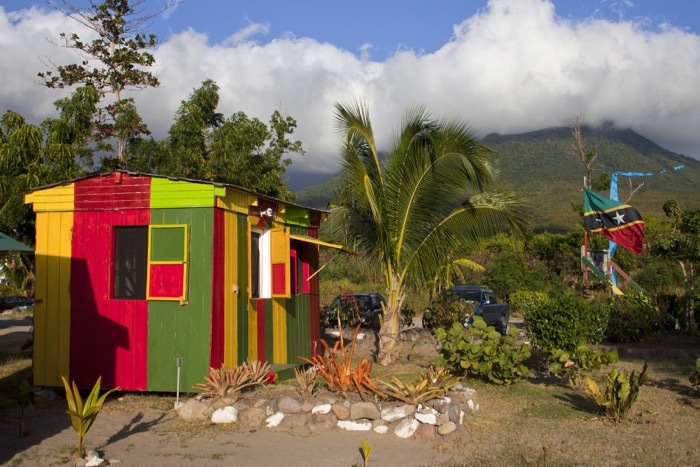 From humble beginnings as a one-man BBQ grill shack, Sunshine’s Bar & Grill has established itself as Nevis’ most favored ocean-front hangout. Specializing in locally caught and grilled seafood such as lobster and mahi-mahi, the fresh flavors and chilled West Indian ambiance of this iconic beach bar are popular not only with locals, but visitors and famous faces alike, Beyonce, John Travolta, Kevin Bacon, Catherine Zeta-Jones, and Mel Gibson have all dined here over the last 24 years. Take a seat underneath the palm-thatched roof of the bar, slowly sip a Killer Bee (Sunshine’s notorious rum cocktail), and graze on a platter of locally caught seafood. Then pair the bar’s unparalleled views of St. Kitts with another Killer Bee (or three), and Sunshine’s will soon have you buzzing! What would you recommend to first-time diners? Visit Charli’s travel blog Wanderlusters to read more about her adventures around the world.